Expected Academic Progress is defined as making appropriate degree progress each academic year by earning a certain percentage of degree applicable units that meet major, support, general education, concentration, and free elective (if applicable) requirements that are directly associated with the student’s declared major. Expected Academic Progress (EAP) is monitored for all students each quarter. The actual academic progress level reflects actual progress made toward your declared degree. Every full-time undergraduate student is required to make reasonable academic progress toward completion of the bachelor’s degree. 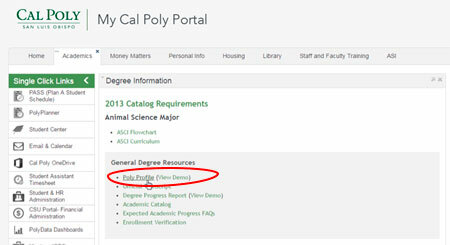 EAP is monitored for all Cal Poly students in order to help them graduate in a timely manner. Students who fall behind in their EAP will be designated as having an EAP deficiency and may be required to meet with their academic advisor. Although this designation will not be noted on their transcript, students will be expected to make up this deficiency. Courses may be used temporarily as Free Electives if your major requires Free Electives. Course substitution paperwork, approved electives, tech electives, or concentration paperwork must be received by the Office of the Registrar no later than the last day of instruction of the term, in order to affect your actual academic progress percentage for next term’s registration. First year: Completion of at least 20% of the total number of units required for the degree. Second year: Completion of at least of 45% of the total number of units required for the degree. Third year: Completion of at least 75% of the total number of units required for the degree. Fourth year: Completion of at least 100% of the total number units required for the degree. First year: Completion of at least 55% of the total number of units required for the degree. Second year: Completion of at least 80% of the total number units required for the degree. Third year: Completion of 100% of the total number of units required for the degree. I have AP credit/transfer units in my course credits not used- Does that count towards my gauge? If your degree requires Free Electives, then the actual academic progress level percentage will include these excess units up to the number of Free Electives required for your degree. If your degree does not require Free Electives, or if you have met your Free Elective requirement, then those units will not count. I am currently in an ICMA (Individualized Change of Major Agreement). Does my gauge go off my ICMA (intended major) or current major? The actual academic progress level percentage reflects progress toward your current major, not your intended major. If you successfully complete your ICMA, then the next time the gauge is updated, it will reflect your new major. How do I know what my actual academic progress level is, and how will my appointment be assigned? You can find your actual academic progress level on PolyProfile, under the Academic Progress heading. The example below is for a student who has an Expected Academic Progress (EAP) Level of 83.3%. However, this student has an Actual Academic Progress Level percentage of 93.9%. This student would be assigned an appointment based on being 93.9% complete. I do not see an Academic Progress Gauge on my PolyProfile. How will I be assigned a registration appointment time? If you do not have an Academic Progress Gauge, you will be assigned an appointment time based on your Student Level (Senior, Junior, Sophomore, or Freshman). Your student level can be found on your PolyProfile, under the “Enrollment History (Unofficial)” heading, next to the current term. Will my in-progress classes count toward my actual academic progress level percentage? Yes. The expectation is successful completion of your current term. Will courses I took only for my Minor count toward my actual academic progress level percentage? Work taken toward a minor does not count toward actual academic progress percentage, unless you have free electives yet to complete. In that case, minor courses count toward free electives. I have a grade of “I” or “RP” on a degree applicable course. Will that count in my actual academic progress level percentage? Yes, the expectation is that you successfully took the class and are awaiting a passing grade. That class, as long as it is degree applicable, will count toward your actual academic progress level percentage. If the grade goes to an F or NC, that will reduce your actual academic progress level percentage the next time it is updated. I have taken Concentration courses, but I haven’t officially declared a Concentration yet. Will those courses count since they are degree applicable? Concentration courses will not count toward your Concentration until you officially declare your Concentration with the Office of the Registrar. However, those courses may be used to temporarily meet Free Electives if your major requires Free Electives. See your advisor if you need help declaring your Concentration. Is there a deadline to declare my Concentration so it counts toward my actual academic progress level percentage? When you are reasonably sure of your Concentration choice, you should declare your Concentration as early as you can so that when you take Concentration courses, they can be included in your actual academic progress level percentage. Your request to declare your Concentration must be received by the Office of the Registrar no later than the last day of instruction for the previous term, in order to affect your actual academic progress level percentage. I have Approved Electives, Course Substitutions, and/or ICS (Individualized Course of Study) courses that require signed forms to be submitted to the Office of the Registrar. When is the latest date I can turn those in so the changes count toward my actual academic progress level percentage? You are strongly encouraged to turn in all forms as soon as possible. The completed form(s) must be received by the Office of the Registrar no later than the last day of instruction for the previous term. Plan ahead, as it can take several weeks to acquire the necessary signatures before the form reaches the Office of the Registrar.